Decorate your home with these elegantly wrapped Frosted Lighted Presents Outdoor Christmas Decorations. 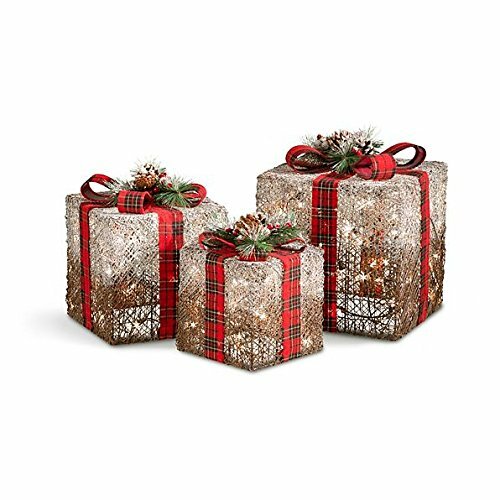 Each of these Christmas decoration presents is lit with incandescent mini-lights and features a plaid bow on top with a frosted pinecone and berries and realistic greenery. Faux grapevine material-wrapped metal frame has a rustic, natural look. These Christmas decor presents nest together for easy off-season storage. Faux grapevine material offers the look of real grapevine without the hassle of storing, breakage, or mildew. Measurements Small: 8"Sq. Medium: 10"Sq. Large: 12"Sq. Decorate your home with these elegantly wrapped Frosted Lighted Presents Outdoor Christmas Decorations. Each of these Christmas decoration presents is lit with incandescent mini-lights and features a plaid bow on top with a frosted pinecone and berries and realistic greenery. Faux grapevine material-wrapped metal frame has a rustic, natural look. These Christmas decor presents nest together for easy off-season storage. Vickerman Silver Lama Indoor Commercial Christmas Bow, 48" x 60"